Blueberries grow best in well-drained soils high in organic matter and with a pH level between 4.0 to 5.0. Amending the soil to keep it in that range will produce the best blueberries. According to the University of Minnesota, even the most prepared blueberry growing area will require amendments to hold the pH level in that range. Soil tests are required to give the grower proper knowledge of the soil and where to begin with treatment. Conduct a soil test from around the blueberry bushes. Take several samples from the area. Combine all samples together and mix well. Dry the samples thoroughly. Take the sample to your local agricultural extension service. Follow the analysis recommendations for pH level adjustment to the soil. Apply 1 to 2 lbs. of elemental sulfur, or garden sulfur, per 100 square feet. This amount of sulfur will lower the pH level by one point. In other words, if the analysis reads a pH level of 6.0, the above described amount will lower the pH down to 5.0. The sulfur will take up to one year to completely lower the pH level. Layer six times the amount, 6 to 12 lbs., of iron sulfate to the same area in place of the elemental sulfur. The iron sulfate changes the pH level in the soil in less than one month. The iron sulfate may be considerably more expensive than the elemental sulfur. Incorporate the pH amendment into the soil around the blueberry bushes with a hand cultivator. Work only the immediate surface of the soil around the bushes. Exercise caution, as the roots of the plants are extremely shallow. Irrigate the chemical into the soil after cultivation. Test the soil the following year. Amend as per the soil test analysis. Both elemental sulfur and iron sulfate are found at most home and garden centers. 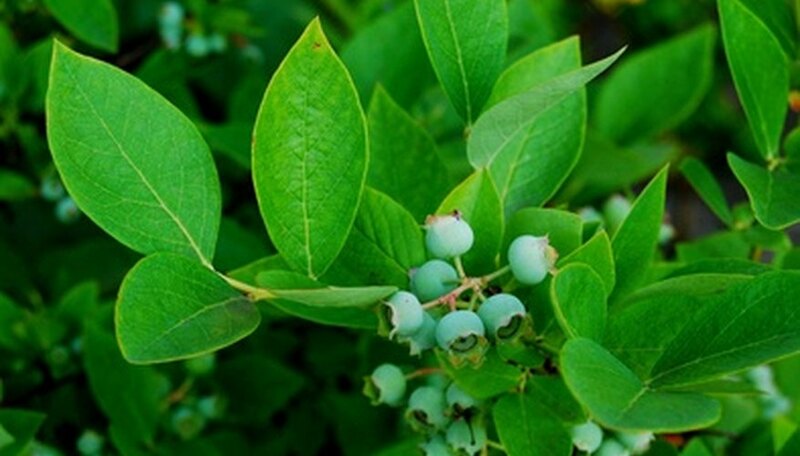 Exercise caution when applying any fertilizer to the blueberry bushes as part of an amendment program. Over fertilization will kill the blueberry plants in one season of growth. It is best to add amendments a little at a time, after the blueberries are planted.